Home › Reviews › Top 10 Sci-Fi Novels in 2016? Top 10 Sci-Fi Novels in 2016? For the first time, The Poisoned Martini is taking a look at the most popular science fiction titles of the previous year. Based on circulation figures at the library where I work, these were the most checked out Sci-Fi novels in 2016. 10. Death Wave by Ben Bova— In the sequel to New Earth, the saga of humankind’s expansion beyond our solar system continues as space traveler Jordan Kell returns to earth with ominous news. The explosion of a black hole in the Milky Way threatens the extinction of the human race. 8. Nemesis Games by James S. A. Corey— The bestselling Expanse series—and basis for the Syfy TV series—continues in this fifth book. Captain James Holden and the crew of the Rocinante struggle to survive as colony-bound ships mysterious disappear and rebel forces bombard Earth with asteroids. 7. Quantum Night by Robert J. Sawyer— The experimental psychologist who developed a flawless technique for identifying undetected psychopaths lurking in society realizes that he is unable to recall his memories from a dark period of his life. 6. Arkwright by Allen Steele— A science fiction writer, convinced humanity cannot survive on Earth, creates a foundation dedicated to establishing a colony in space, a task that will span generations. 5. A Borrowed Man by Gene Wolfe— E. A. Smithe is an AI clone with the personality of a deceased mystery author. Colette Coldbrook “borrows” Smithe from the library because a print book by the deceased author was in her murdered father’s possession, and Smithe may be the only key to an important secret. Such an intriguing premise! 4. Ultima by Stephen Baxter— The discovery of alien artifacts that allow humans “to step across light-years of space as if they were stepping into another room” leads to a more terrifying truth. 3. The Autobiography of James T. Kirk by David A. Goodman— This fictional memoir chronicles the life of Starfleet Captain James Tiberius Kirk (2233-2371). This “autobiography” mines 50 years of Star Trek lore to create an “in-universe” account of the famous captain’s exploits and personal history, including illustrations and artwork and “editor’s notes” throughout the narrative to “correct” inaccurate recollections. 2. The Long Cosmos by Terry Pratchett & Stephen Baxter— In the concluding volume of the bestselling Long Earth series, as hyper-intelligent post-humans mobilize to build a massive artificial intelligence Machine, septuagenarian Joshua Valienté sojourns among a collective-intelligence species of trolls and learns profound truths about life on the Long Earth. 1. 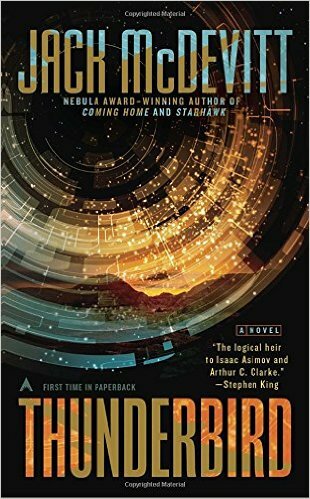 Thunderbird by Jack McDevitt — A 10,000-year-old gateway leading to three mysterious destinations is unearthed in North Dakota on a Sioux reservation, and Sioux Chairman James Walker finds himself at the center of a race to explore, exploit, and control the discovery and its teleportation technology. And there you have it, the most popular science fiction reads in 2016. Many of the picks are from established authors, but there are a few new voices in the mix. The colonization and exploration of space continues to be a dominant theme, but a few break that mold. A Borrowed Man, in particular, stands out with its noir-esque Blade Runner-like storyline. So are you delighted or disappointed? How many have you read? And which books would make your top ten list? « Top 10 Fantasy Novels of 2016?